And thus, the above ayaat explains the purpose of travel. Not sun, sea and sand, but hearts, eyes and ears. "What can my enemies possibly do to me? My paradise is in my heart; wherever I go it goes with me, inseparable from me. For me, prison is a place of (religious) retreat; execution is my opportunity for martyrdom; and exile from my town is but a chance to travel." What can you do to a man who has an outlook like that? one who has paradise in his heart, for whom God is always present, always watching. "...a universe where the centre is everywhere, and the circumference nowhere"
And there are certainly lots of lessons to be learnt from Andalus, especially in this time and age when there is a huge black hole when it comes to islamic history, even among muslims. Back when the world wasn't governed by Uncle Sam, science was very much in line with religion and economic growth wasn't the topmost priority. 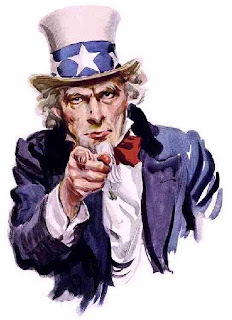 I WANT YOU!..to learn about our history and act on it. If the US of those days was Baghdad and the middle East, Andalus was probably its Australia. The Jewel of the West, back when Britain was probably a collection of mud huts and dragons and ogres. But the difference between that civilisation and the current one is in its values, and as we shall see in Andalus God was present in every aspect of their cultured life. And the most important point is, as with every other thing in Islam, everything serves to get people closer to God. If it is a civilisation, it is a civilisation to get people closer to God. If you are a man, you are a man to bring other people close to God. how could i do justice to such a rich era with a few paragraphs? i think i'll never can. But these are just my feelings and reflections on visiting Andalus. The buildings are of second importance, the real lessons lie with the people who opened Andalus and saved it from the Dark Ages plaguing the rest of Europe. What sort of people could open up countries with lightning speed? what was their faith like? how was that faith translated into action? surely they did not just sit in masjids and in front of TVs every day. These are the burning questions for people with hearts, eyes and ears.